When you injure your spinal cord in an accident, it will most likely affect every aspect of your life. You endure physical suffering, not to mention it can be devastating to your career, financial affairs, your community and family life. If you or a loved one is injured in an accident, the Spinal Cord Injury attorneys at The Boccardo Law Firm are ready to help you with the compensation necessary to live your life. With more than 80 years of helping injured victims, The Boccardo Law Firm get results. Our expertise includes both an understanding of the law and spinal cord injuries. We spare no cost to use nationally recognized medical experts that present compelling arguments and detailed life care plans to juries. Below are some of the statistics for the average Spinal Cord Injury Victim. The average age at injury is 42 years old. Males account for approximately 80% of new spinal cord injury cases. The average hospital stay for a spinal cord injury is 11 days. A spinal cord injury is overwhelming for the victim, but in addition it causes undue stress for their family or support system. The Boccardo Law Firm will protect your legal rights and get you the compensation that you deserve. A Spinal Cord Injury can have severe personal economic impacts. Medical costs can easily top millions of dollars. In the event that your injury disrupts your ability to work, it can also affect your lifetime earning potential. A spinal cord injury can limit your opportunities to get a job and costing you tens of thousands of dollars. Generally, one year after a spinal cord injury, only 12% of victims are employed. The long-term numbers are even greater. In 20 years, post-injury, only 1/3 continue working. About 30% of spinal cord injury sufferers are re-hospitalized one or more times following the injury. Among those re-hospitalized, the length of hospital stay averages about 22 days. The estimated lifetime costs directly attributable to spinal cord injury include both health care costs and living expenses. They vary based on education, neurological impairment and pre-injury employment history. A Spinal Cord Injury may result from any sharp blow or cut to the spine, particularly to the vertebrae. This causes irreversible damage to the spinal cord and the nervous system. The spinal cord is often traumatized in a major accident involving a car or truck. How Do you Know if You Have Suffered a Spinal Cord Injury? When someone suffers head or neck trauma, there are two types of spinal cord injuries that may occur. Complete; Almost all feeling and all ability to control movement are lost below the spinal cord. Incomplete: Some motor or sensory function below the affected area. Anterior Cord Syndrome: An injury to the front of the spinal cord that damages the motor and sensory pathways in the spinal cord. You may retain some sensation, but struggle with movement. Central Cord Syndrome: An injury to the center of the cord that damages nerves carrying signals from the brain to the spinal cord. You may experience loss of fine motor skills, paralysis of the arms, and partial impairment. Brown-Sequard Syndrome: An injury to one side of the spinal cord. Movement may be impossible on the right side, but may be fully retained on the left. The degree to which Brown-Sequard patients are injured greatly varies from patient to patient. Anyone who has experienced significant head or neck trauma needs an immediate medical evaluation for the possibility of a Spinal Cord Injury. It is important to realize that a serious spinal injury may not be immediately obvious. Numbness or paralysis may not develop immediately. It may be gradual as bleeding or swelling occurs in or around the spinal cord. However, if not diagnosed, a more severe injury may occur. It is our job to get you the compensation that you deserve to help you manage life with a Spinal Cord Injury. We are available to assist you if you suffered spinal cord injury in San Jose, the San Francisco Bay Area or Santa Cruz County. Let The Boccardo Law Firm protect your rights as a spinal cord injury victim. Call us at 408-298-5678 for a free consultation. 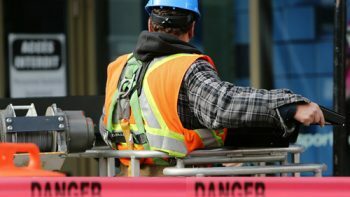 There are numerous occupations where the negligence of another person who is not your employer results in your injury. This may allow you to file a lawsuit for pain and suffering. Free Consultation. Talk to an Attorney. An attorney-client relationship is NOT established through the use of this form for communication with the firm or any individual member of the firm. Legal representation requires a separate fee agreement and written representation signed by both you and The Boccardo Law Firm. Confidential or time-sensitive information should not be sent through this form. The Boccardo Law Firm, Inc. The Boccardo Law Firm is a San Jose, California personal injury law firm with a commitment to providing exceptional client service and obtaining outstanding results. We have a solid reputation for integrity and ethics. Copyright © 2019 The Boccardo Law Firm. All Rights Reserved.